Asphalt emulsions are the best eco-friendly way to reduce costs, recycle and re-use old paving material. A tack coat is a spray application of asphalt emulsion which provides a layer which creates a bond between the current existing pavement and a new overlay. Tack coats increase the strength and fatigue life of your pavement at a much lower cost. A well-laid tack coat provides a uniformly thin, sticky adhesive film without running off the road or causing any slippage between the old and new pavement. The tack coat is sprayed at an equal rate from an asphalt distributor. • There is a reduced pushing and shoving in the new asphalt surface. When is a Tack Coat Needed? A tack coat usually needs to be applied to an existing pavement surface before another layer of HMA is laid. This is done with all surfaces. 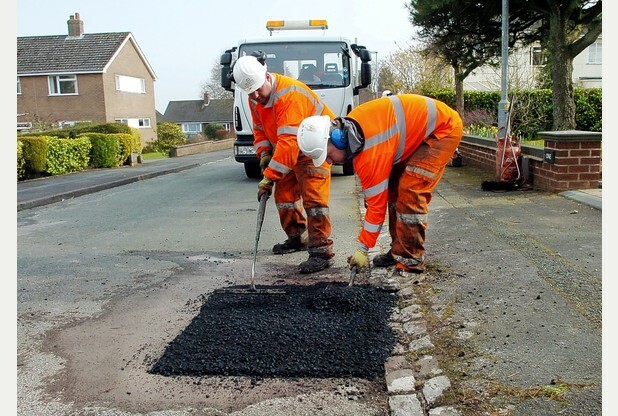 In certain cases, a tack coat is applied to a new HMA pavement before the next layer is applied-such as between an HMA surface and an HMA leveling course. Many people believe that a tack coat is needed to provide a “bond” between the existing pavement surface and a new HMA layer to prevent it from sliding on the existing pavement layer. Regardless of the kind of material used, the application rate of the tack coat material is not that important; it is the residual amount of asphalt binder which remains on the surface after the tack coat material has set. The total amount of residual tack coat material on the current pavement surface only covers 90 to 95% of the existing surface. So 5 to 10% of the surface remains exposed to the elements once the tack coat has been applied. Too little tack coat can lead to a significant reduction in the strength and durability of the pavement structure. Too much tack coat, however, can create a slip plane between the two layers and cause the upper layer to slide down on the lower layer. It has been discovered that the bond develops with time, traffic and weather. The bond will still develop even though only 90 to 95% of the existing pavement surface is covered with tack coat. It is not right to apply the same amount of tack coat material to all pavements regardless of the condition of the surface. If that surface is new and shiny, then it will only require a minimum amount of tack coat, as only a little tack material will be absorbed. If the existing pavement surface is aged and oxidized, an increased amount of tack should be applied to compensate for any materials that might be absorbed into the old surface. Also if the current pavement surface contains any hairline cracks, the residual amount of the tack coat material should also be increased slightly. If a new leveling course has been applied over the underlying asphalt, it may not be necessary to apply a tack coat on the new levelling course. If the levelling course layer is clean and smooth, there will be minimal absorption of the tack coat material. Application of a tack coat between new layers of HMA is beneficial in reducing the occurrence of top-down cracking in the new layers. In addition, tack coat between new layers of HMA should be required in locations of accelerating or decelerating traffic, turning areas, steep grades, high volumes of traffic, very hot climates and between relatively thin layers of HMA. Some individuals believe that a tack coat does not need to be applied to a milled pavement since the rough, milled surface texture prevents the new pavement layers from sliding. But it is highly recommended that a tack coat should be applied to the milled surface to help achieve a bond between the new and old pavement layers. Another factor to take into consideration is the type of terrain where the pavement is located. If the grade is flat, the residual tack coat application rates given are typically adequate. If the road is being paved in a hilly or mountainous region, it is better to reduce the amount of tack coat. It is crucial to note that an excessive tack coat on the pavement surface in mountainous terrain can cause problems with the slippage of the haul trucks and the paver in the tack coat when moving up or down hill and slippage of the completed pavement course at the interface between the layers. Another factor is the environmental conditions at the time of paving. If an asphalt emulsion is used for the tack coat, and if the humidity is very high, the emulsion setting and curing time will be extended. A change from an asphalt emulsion to an asphalt binder is also possible.